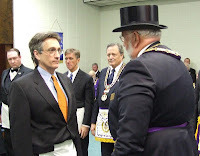 On December 3, 2011, Most Worshipful Brother Terry L. Seward, Grand Master of the Grand Lodge of Illinois, exercised an authority unique to Grand Masters and made Brother Clifton Truman Daniel a Mason at sight. Brother Daniel is the oldest grandson of Most Worshipful Brother Harry S. Truman. It has happened many times before to dozens of men who have become "true and faithful" Brothers among us. Milton Eisenhower, Charles W. Fairbanks, Andrew Mellon, Booker T. Washington, William Howard Taft... all were made Masons at sight. A couple of years ago basketball standout Shaquille O'Neal and Oscar-winning actor Richard Dreyfuss became Masons at sight. It might be said a full list of Masons at sight reads like a Who's-Who of Masonry. Yet many Masons have reservations about the practice, feeling it dilutes the experience of becoming a Freemason and somehow indicates the Mason at sight Brother somehow lacks enthusiasm for or knowledge about the fraternity. at Matteson Lodge #175 in Joliet, Illinois. The conventions for making a Mason at sight, as most everything else in the Craft, vary from jurisdiction to jurisdiction. In some jurisdictions, including mine — Missouri, the making of a Mason at sight is prohibited. In general, however, the procedure employs some form of ritual and obligation and has guidelines for how many Brothers must be present. According to Mackey, "The mode of exercising the prerogative is this: The Grand Master summons to his assistance not less than six other Freemasons, convenes a Lodge, and without any previous probation, but on sight of the candidates confers the Degrees upon him, after which he dissolves the Lodge and dismisses the Brethren." Of course, not everyone does things according to Mackey. Still, some Brothers hold the general conception that the process of making a Mason at sight is almost literal: The Grand Master snaps his fingers and, voilà! A new Mason. It doesn't work that way. "In this case," said MWB Seward, "it means there was no petition, no investigation and the ceremony was slightly shorter. I made every effort to ensure Brother Daniel was comfortable doing things this way because I didn't want him to miss anything and didn't want him to feel he wasn't getting the full experience." And so it was. Brother Clifton was obligated in the Entered Apprentice and Fellowcraft degrees and received an impressive and full Master Mason degree. Whatever he missed he could easily pick up by viewing the first two degrees. The entire ceremony was solemn, well-orchestrated and beautifully conducted — far more than a snap of the fingers. The group of Brothers who witnessed Brother Daniel's raising were virtually unanimous in complimenting the ceremony after it was over. They overwhelmingly congratulated the Grand Lodges of Illinois and Missouri for the work. And Brother Clifton expressed the same sentiments. To look at it from another point of view, every one of those fortunate to be in attendance in that packed Lodge room in Joliet can now say something very few can claim, "I saw the making of a Mason at sight." Note: The accompanying pictures are from Brother Daniel's actual degree ceremonies and were taken and published with the joint approval and permission of the Grand Masters of Illinois and Missouri, Terry L. Seward and John W. Hess. Steve Harrison, 32° KCCH, is a Past Master of Liberty Lodge #31, Liberty, Missouri. He is the editor of the Missouri Freemasonmagazine, author of the book Freemasonry Crosses the Mississippi, a Fellow of the Missouri Lodge of Research and also its Senior Warden. He is a dual member of Kearney Lodge #311, St. Joseph Missouri Valley of the Scottish Rite, Liberty York Rite, Moila Shrine and is a member of the DeMolay Legion of Honor. I think the experience of the first degree, is not something that could be gained by watching. Nonetheless, an honorable member, and I'm sure a powerful experience for him. I agree, I am not one for anything other than long form single degree work. But I agree with you, an honorable new member. I'm wondering if they have to return degree work? Catechisms? John Kerry: Freemason Or Not? Lodge Tips: The First in a Series.